It’s official, everyone seems to have gone crazy about the new mobile app Pokémon Go, based off the original game and creatures from the Japanese show and video game that were big in the 1990s. The app has made a resurgence of Pokémon with not only children of the 90s but with all age groups, and it’s led to some weird and sometimes scary incidents. For example, one young lady in Wyoming was walking along a river trying to capture a Pokémon when she came across a dead body. In another situation, one user was walking along, paying attention to his phone and fell down a ditch fracturing his foot. This was only in the first few days of the game being available to users. Since then even more incidents have occurred, including two men falling more than 50 feet off a cliff while playing the game. Now, the game is pretty simple. By using your GPS coordinates, the game allows for you to search for Pokémon in the real world. You can then capture them by throwing poké balls when you come a across one. This means having to walk around until you find one. Hey, it sounds pretty fun, and on another upside, it gets people up and about. You’ll get plenty of steps in. Additionally, players can train their Pokémon at “gyms,” which are actual sites. Apparently, some guy’s house in Massachusetts ended up a gym, and strangers keep showing up. Surely, this is problematic and could lead to some uncomfortable situations. However, Niantic, the maker of Pokémon, does provide players and others the option to report unsafe or unwanted locations. 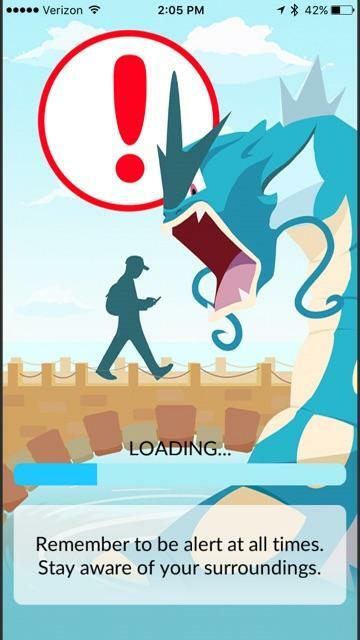 By visiting the Pokémon Go website, you can report game problems with a Pokéstop or Gym and even request removal of a Pokéstop or Gym. So what does this all mean from a legal standpoint? What if you are out hunting Pokémon and you are injured, like the one guy who broke his foot? First off, you need to recognize that if you are choosing to play this game and you fall down a ditch, or trip over a tree root, or whatever you think could happen, you were being negligent in not paying attention around you. So, the first rule of catching Pokémon is to be safe. Not only should you be cognizant of where Pokémon are hiding in your local area, but you need to be aware of the risks around where you are. Make sure you are in a safe place and you are aware of any risky places you could run into. Also, don’t trespass on to other people’s property. Normally, a landowner does not owe a duty of care to a trespasser unless the landowner willfully or deliberately caused the trespasser’s injuries. And an individual’s need to catch a Pokémon doesn’t qualify for that. A trespasser is a person who is on the land of another without that landowner’s consent. If you are injured on this property, the landowner is not responsible for your injuries. We want to inform you that while Pokémon Go can be fun, and we’re certainly not telling you to not play it, we want you to be aware of the dangers that may be associated with it. Distracted walking can be just as dangerous as distracted driving, and we want you to be safe. Please be aware that if you are injured while playing, the injury may be associated with your distraction, and not necessarily the fault of someone else. Recently, a teen was hit by a car while she was crossing the street playing Pokémon Go. She blamed the app for taking her into an area she would not have gone into otherwise. Also, on the note of distracted driving, let’s remember not to catch Pokémon while driving. Remember that Pokémon characters disappear and move to different locations in the game. If that coveted Ponyta is in an unsafe or inappropriate location, you can wait for it to be in a more suitable location. And one of those unsuitable locations is always behind the wheel. We still want you to have fun catching ‘em all, but please put safety first.